Is It Safe to Eat Tomatoes Infected With Late Blight? You planted your tomatoes and potatoes, and they started out just fine. At some point in the season, however, they developed large, irregularly shaped, greasy gray spots or even soft rot. These are symptoms of late blight, a serious plant affliction that led to the Irish Potato Famine. Although plants infected with late blight tend to die quickly, you will probably be able to salvage some tomatoes and potatoes before the plants are gone. Are they safe to eat? Can you still store them? Should you risk replanting next year? Here are some answers. Late blight is a fungus-like disease that can impact both tomatoes and potatoes. While it typically occurs late in the season (as its name implies), it can strike at any time. Not only does the pathogen destroy the fruits of the plant it infects, but it can also spread very quickly and widely. Late blight can overwinter, meaning that even after a cold frost it can still return the following year if the plants and soil containing the pathogen are not removed. Because it is carried by spores, late blight can travel long distances. If you do determine that your plants have been infected, it's a good idea to contact your Cooperative Extension Service to let them know. There's a good chance that your infection came from another local source, or that your plants' infection will affect others. One interesting note McGrath makes is that the USDA Complete Guide to Home Canning says you shouldn’t use diseased tomatoes for canning because it can raise the pH of otherwise acidic tomatoes high enough to allow bacteria or other spoilers to grow. It can also affect the flavor, so choose only your freshest, healthiest tomatoes to preserve. 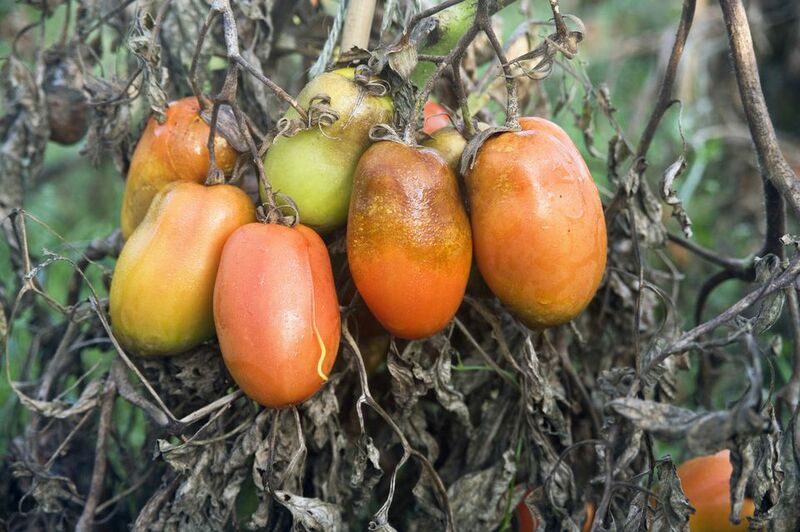 Tomato diseases like to stick around from year to year, but late blight needs living tissue to survive. Drying, saving and using seeds from tomatoes infected with late blight is fine. However, it’s still smart to plant your tomatoes in a different section of your garden and to clean up all affected foliage and leftover fruits in the fall. Throw them away, don’t compost. Potatoes are another story. Since potatoes are still alive when you store them, they could harbor the disease. Eat and enjoy your potatoes this winter. Growing underground, their taste is probably unaffected. Just be sure you don’t leave any potatoes in the garden over winter and start with fresh seed potatoes in the spring. Is There Such a Thing as Rabbit-Proof Plants? What Is the Safe Seed Pledge and How Does It Work? What's a Foolproof Way to Start Seed Indoors?